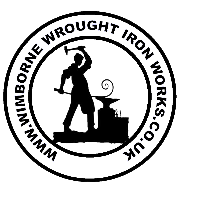 or through the website www.wimbornewroughtironworks.co.uk (“We”) to the consumer (“You”). Please read these Terms and Conditions carefully as they affect your rights and liabilities under the law and you will be bound by these if we accept your order. If you do not agree to be bound by these Terms and Conditions then please do not continue to place any orders through this site. 1.1 We must receive payment of the whole of the price for the goods that you order before your order can be accepted. Once payment has been received by us we will confirm that your order has been accepted by sending an email to you at the email address you provide. Our acceptance of your order brings into existence a legally binding contract between us. 2.1 The prices Payable for goods that you order are set out in our website. 3.1 You may cancel your contract with us for the goods you order at any time up to the end of the seventh working day from the date you receive the ordered goods. You do not need to give us any reason for cancelling your contract. Please notify us if there is any problem with the goods at the time of cancellation. 3.2 We will refund you the full cost of the goods upon receipt of the returned goods in satisfactory condition. 3.4 If you have received the goods before you cancel your contract then you must send the goods back to our contact address at your own cost and risk. If you cancel your contract but we have already processed the goods for delivery you must not unpack the goods when they are received by you and you must send the goods back to us at our contact address at your own cost and risk as soon as possible. 3.5 Once you have notified us that you are cancelling your contract, any sum paid to us from your credit/debit card will be re-credited to your account as soon as possible and in any event within 14 days of receipt of your returned goods PROVIDED THAT the goods in question are returned by you and received by us in the condition they were in when delivered to you. If you do not return the goods delivered to you or do not pay the costs of delivery, we shall be entitled to deduct the direct costs of recovering the goods from the amount to be re-credited to you. 3.6 The cost of carriage to you is not refundable. 4.2 If we do cancel your contract we will notify you by e-mail and will re-credit to your account any sum deducted by us from your credit card as soon as possible but in any event within 14 days of your order. We will not be obliged to offer any additional compensation for disappointment suffered. 5.1 We will deliver the goods ordered by you to the address you give us for delivery at the time you make your order. A valid signature will be required upon collection or delivery. 5.2 Delivery will be made as soon as possible after your order is accepted and in any event within 10/30 days of your order but can be longer on our busy times. 6.5 Notwithstanding the foregoing, nothing in these terms and conditions is intended to limit any rights you might have as a consumer under applicable local law or other statutory rights that may not be excluded. 7.1 Unless otherwise expressly stated in these terms and conditions, all notices from you to us must be in writing and sent to our contact address and all notices from us to you will be displayed on our website from to time. 13.1 We endeavour to ensure that the photographs appearing on the site represent an accurate illustration of the goods in question however the colour may vary slightly due to differences in computer graphics. 13.4 Images, style, layout and code are all copyright. Reproduction in whole or in part is strictly prohibited.